Recently, modified directly observed therapy (MDOT) has emerged as a promising intervention to address nonadherence for hard-to-reach populations infected with HIV. To date, there are no existing data on MDOT focusing exclusively on African Americans. 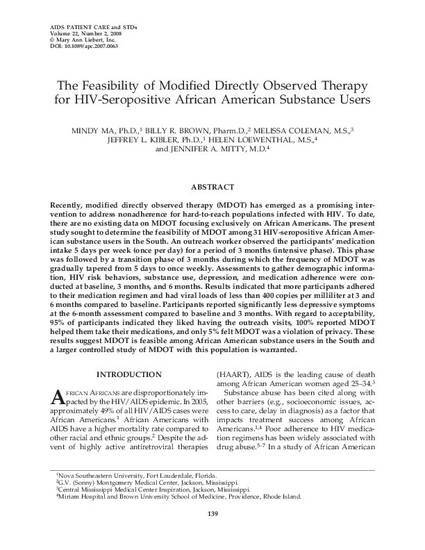 The present study sought to determine the feasibility of MDOT among 31 HIV-seropositive African American substance users in the South. An outreach worker observed the participants’ medication intake 5 days per week (once per day) for a period of 3 months (intensive phase). This phase was followed by a transition phase of 3 months during which the frequency of MDOT was gradually tapered from 5 days to once weekly. Assessments to gather demographic information, HIV risk behaviors, substance use, depression, and medication adherence were conducted at baseline, 3 months, and 6 months. Results indicated that more participants adhered to their medication regimen and had viral loads of less than 400 copies per milliliter at 3 and 6 months compared to baseline. Participants reported significantly less depressive symptoms at the 6-month assessment compared to baseline and 3 months. With regard to acceptability, 95% of participants indicated they liked having the outreach visits, 100% reported MDOT helped them take their medications, and only 5% felt MDOT was a violation of privacy. These results suggest MDOT is feasible among African American substance users in the South and a larger controlled study of MDOT with this population is warranted.